Kinda gettin a late start, but I've been wanting to start a thread for people to share their pics, stories and adventures fishing this year. I've already been to the coast (eureka, ca) 3 times this year and to bodega bay once. I can't see going back to bodega bay, only see myself fishing there by chance if I were to be going through on a trip. My first trip to the coast this year was a bust with waves bigger than I've seen there before, something like 12+ feet that day. Worst, nastiest conditions I've ever tried fishing. Second time I fished another spot across the jetty and tried poke-poling for the first time and am now hooked. Caught a couple species of fish I'd never caught before, lots of small cabezon and 2 prickleback monkeyface eels. First eel I caught was a total shock, was huge and snapped my slightly frayed 17lb test as soon as I began lifting it out of the water. Lesson learned. Caught another smaller one but let it go since I couldn't pull up the info on the dfg website and didn't wanna keep it out of the water too long. Third time I went over was tuesday. Caught a very nice sized fish on the rod trying out a new bait I got for an upcoming charter out of the bay area. Flopping around in the waves it looked flat and wide, so I thought it was a small halibut or a large flounder, but my excitement grew when I got it close and realized it was a keeper cabezon! I swear I measured it 6 times before cutting it's gills. They need to be 15" to keep and it was 17.5" on the nose. Kept alternating between poke-poling and rod/reel the rest of the day and only caught a few more fish there, couple small cabezon and my first kelp greenling, which sadly was just under the limit. Left there and decided to drop a sabiki rig off the dock where the bums hang out in town, and luckily ran into an old fella who was leaving as I pulled up, but decided to stay and fish with me after we spoke for a minute. He was trying to catch bait to fish for leopard sharks that night, so as I caught stuff I'd ask him if he wanted it. Caught a few jack smelt, one of which I gave him for bait, a large anchovy, a keeper red tail perch and a few small piling perch, all of which were firsts for me. Not a bad way to end the trip! I will eventually download a pic re-sizer for the iphone (suggestions appreciated). 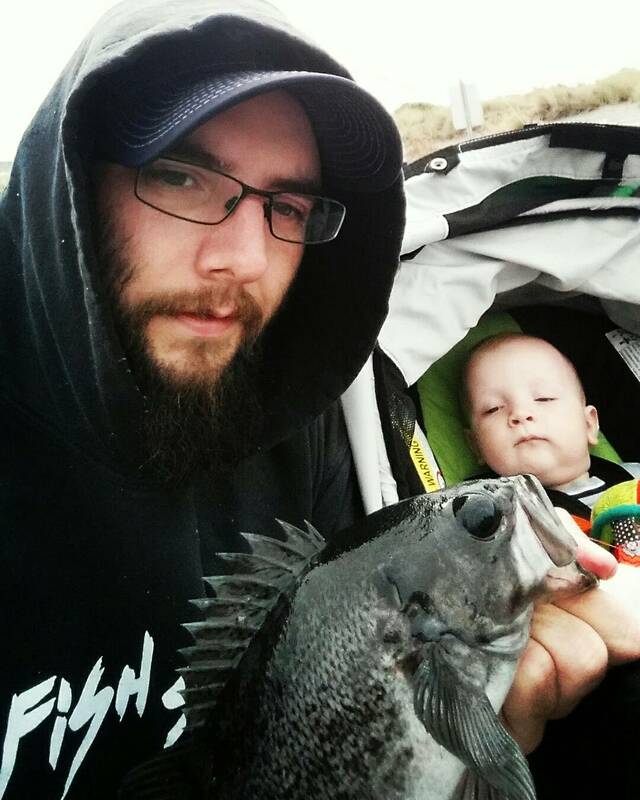 So fire away, share your stories and pics of your fishing adventures! No pics cause I don't like touching the phone with fishy fingers or next to the water, but I had another productive and educational day fishing the jetty by eureka yesterday. 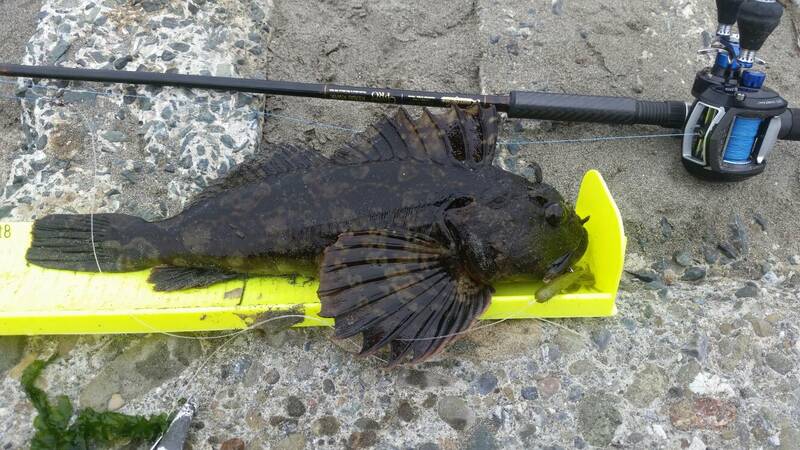 Caught a small cabezon on the poke pole and lost a couple rigs casting out for lingcod. About the time I decided to start fishing my way back toward the truck, a younger couple came by and stopped to ask how I was doing, then showed me a couple nice lings when I asked how they did. The guy asked if I had a certain type of rubber lure and jig heads, then gave me a couple of each despite me saying no thanks and told me a couple better places to go where I wouldn't lose as much gear. It was a pain to get to his first spot but did get me a slightly too small ling on my first cast. I got out of there cause I felt like I would be trapped if a decent wave came through, so I moved over a little and hooked another fish on my first cast again, which turned out to be my biggest black rockfish to date. Tried a couple more spots and decided to call it a day since I was getting sunburnt but stopped to talk with a guy fishing the beach side on my walk back. Just as I was asking what he was catching his rod launched forward and barely got caught on the rock it was learned against. The fish seemed to be fighting pretty hard and he asked if I would gaff it for him. I got quite soaked by the waves but it was cool to be there at the right time to help someone land a nice fish. With that I was anxious to try a little more and found a spot the first guy had suggested I try. Worried about snagging and losing more gear, I was barely letting my lure hit the bottom before I began a quick retrieve and saw a nice ling follow my lure almost all the way back to me. I casted several more times in the same general area and hooked something nice on the way back. It was a pita to hoist it out of the water and I questioned whether or not it was legal length (22") and after measuring a few times with my thumb and pinkie finger I determined it was legal. No pics taken again, but we did our 2nd halibut trip to the bay yesterday and did about the same. I caught my first striper, then 3 more before catching a legal one. My friend caught a small shark, then nothing for several hours, just like our last trip, then started catching nice keepers the last part of the day. I have the boys starting to video their antics. Maybe a H8PVMNT Lifestyle youtube channel is in the works . Page created in 1.629 seconds with 35 queries.